Review: The summer of 2014, the summer where we all poured a bucket of ice water on our heads donating money towards Amyotrophic Lateral Sclerosis (ALS), more commonly known as Lou Gehrig’s disease. Yet its arguably most well known patient is one Professor Stephen Hawking, one of the world’s finest living minds whose work has had a tremendous impact on the world of science. 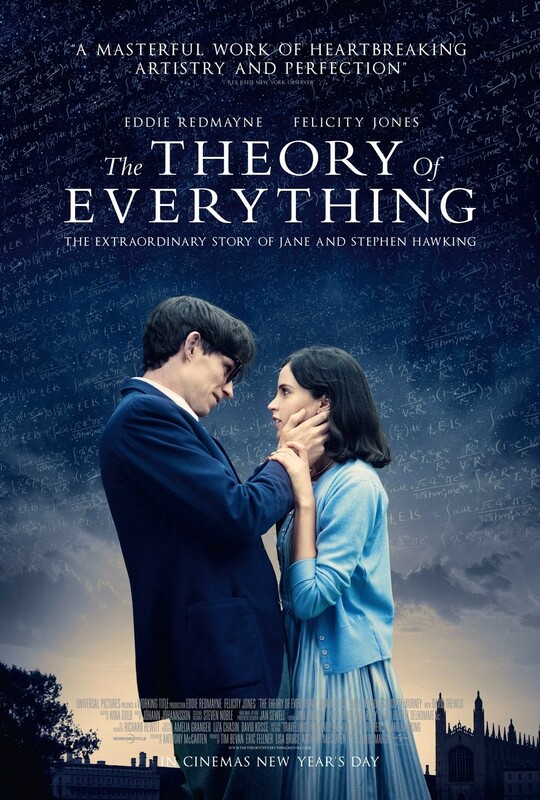 Through this moving biopic, with a screenplay adapted from the novel Travelling to Infinity: My life with Stephen by Jane Hawking, we see how the disease took hold of him and how his condition worsened as the years went by, but his spark of brilliance never waned despite the horrific and brutal nature of ALS that slowly withered his condition. We see a young Stephen (Eddie Redmayne) in his university years before his illness really takes hold, and how he meets Jane Wilde (Felicity Jones) While both are studying opposite subjects, they form an immediate bond that leads to an engagement and marriage. In the initial stages, it all seems so perfect, dancing by a pond, watching some fireworks illuminate the night sky with Stephen showing off his incredible intelligence. Yet their marriage has to undergo the most horrific of challenges that could very easily tear it apart, as his illness gradually gets worse and worse. Yet through all these tests, their bond despite all these intense tribulations is a hard one to break, and through that it delivers a very heart warming movie with drama, suspense and some terrific acting. When you do not seen an actor in a film, instead you see a character who , it is obvious you are witnessing a special performance, and that is certainly the case with Eddie Redmayne. His performance as the famous physicist was nothing short of exceptional. As the illness worsens and deteriorates his condition further, resulting in more and more impairments, it is truly a sensational performance. Every time he loses a sense or feeling in his body, he has to act that way, and as such . Towards the end, you actually felt you were watching the great man himself, and this is recognised as the great professor thought that it was himself on screen. Equally on top form is Felicity Jones as Jane Hawking. Her undying love for her husband is the emotional rock that binds this story together, and even as the illness takes a greater hold, she does not wilt, but merely grows stronger. Their love goes through the sternest of challenges and both deliver wonderful performances that landed both Oscar nominations, and Redmayne duly scooped among many other awards, the Oscar for Best Leading Actor. As the story unfolds, the genius of Hawking is explored. The theory of black holes and gravitational singularities, which constitutes arguably some of Hawking’s most important work is brought to the fore. Rather like Christopher Nolan’s Interstellar, James Marsh weaves complex science and theories with romance, chemistry and how love has a tremendous power, that even a crippling disease such as motor neurone disease cannot contend with. While the former was filled with mind boggling scientific theories in almost every frame, the theme of love and compassion is more prevalent in this story. There is mention of the science and of Hawking’s work, but it is ultimately about his life and his family. The love and desire for each other is fierce as Hawking’s initial diagnosis of no more than two years left to live leaves their relationship on the rocks. Many black holes threaten to break the marriage down, but the bond between the two stands firm, because as Hawking himself says “however bad life may seem, where there is life, there is hope.” Though a little slow at times, through Anthony McCarten’s excellent screenplay, combined with a superb score by Jóhann Jóhannsson, the film is a superb account of one of the greatest minds alive today.